Wiggling tails walking all in a line, one behind the other. Four white Call ducks have recently made our backyard their home. Their name refers to their loud quack, which is quite delightful as they like to announce our presence in the yard, but are otherwise generally quiet. We picked them up as an early Christmas present to ourselves in mid December from a lady we met at a permaculture garden tour. She had bought them at the markets on a whim as fluffy ducklings (who could resist!) at a reduced price from the breeder as they were his last to go for the day. We enjoyed the opportunity to stickybeak at her wonderful rambling permaculture garden in a small suburban Cardiff backyard when we picked up our new feathered friends. She had many different pens full of vegies, chickens and our three month old ducks. We noted that the duck water was tipped onto nearby vegies each day, a great example of using waste from one system to nourish the next. 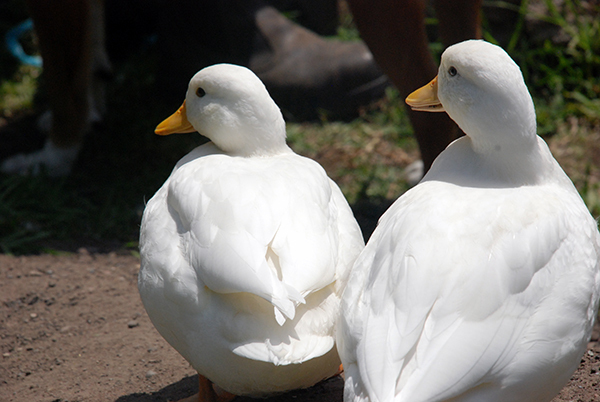 Call ducks are particularly suited for backyard pets. A bantam variety, weighing in around 500g for a female and 600g for a drake, their size lends them to thrive in smaller spaces than that required by a full size breed. Our ducks (Dilly, Duffa, Darling and Dennis - with thanks to my young neighbour for the names) have the run of the area set aside for our new orchard (approximately 75 - 100m squared) and access to the vegie patch on an ad lib basis. They have proved to be real little characters, as is typical of their breed. They like to follow us around, and are very inquisitive. The drake, who has recently developed into a bold little fellow, is taken to pulling on the end of our dogs tail. Being a small breed however means they are good fliers. We watched them stand on a mound of dirt in our yard each day (duck hill we call it), flapping their wings to strengthen them. Before we saw any lift off our neighbour was at our door with a cuddly white bundle she had found in the her yard. There was a loud quacking, she related, much louder than normal, when her three year old found the duck under the shrubbery. "Where can I get some?" was her question to us. A quick clip of the wings and our ducks have been kept down to earth. 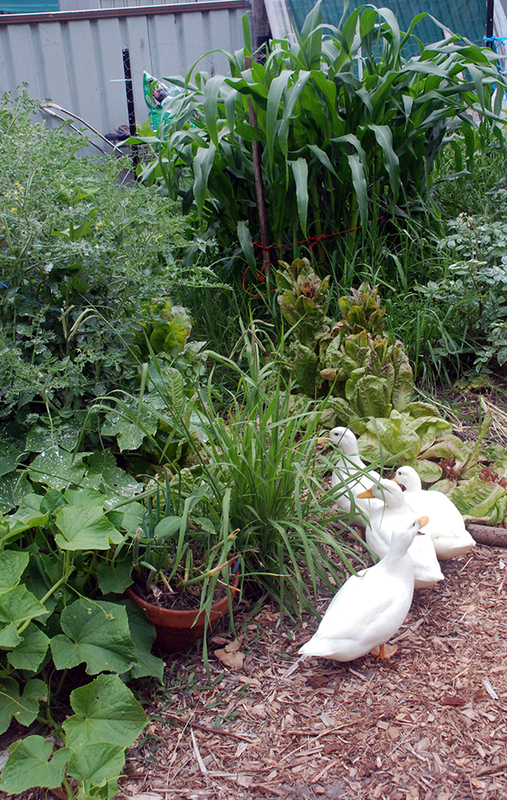 Ducks offer a valuable service to the home vegetable gardener. They actively, apparently more so than chickens, seek out bugs, snails and any other tasty morsels, including dead rodents. 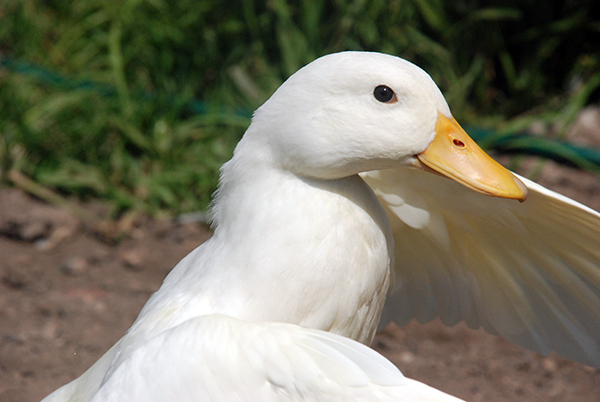 Ducks dip their beaks into the earth and filter it through, consuming anything that moves. We are looking forward to finding out how much of an impact they have on our pest population. They have access to the more mature areas of the vegetable garden, and are kept away from small seedlings that may become trampled or eaten. The Call duck are not a particularly good layer, but combined with the efforts of our chickens, our garden will be fertilised, pests controlled and weeds dug, with plenty of eggs for us and our friends. Not to mention the entertainment factor for us.